Widing Custom Homes is honored to showcase various print works their projects and the WCH brand has been fortunate enough to be featured in over the years. O’Toole, E. B. (2010, Autumn). The Perfect Getaway. Michigan Home and Lifestyle, 117-124. “Expert planning and a lifetime of water living fuse for a home experience like no other” (O’Toole, 2010, p. 119). 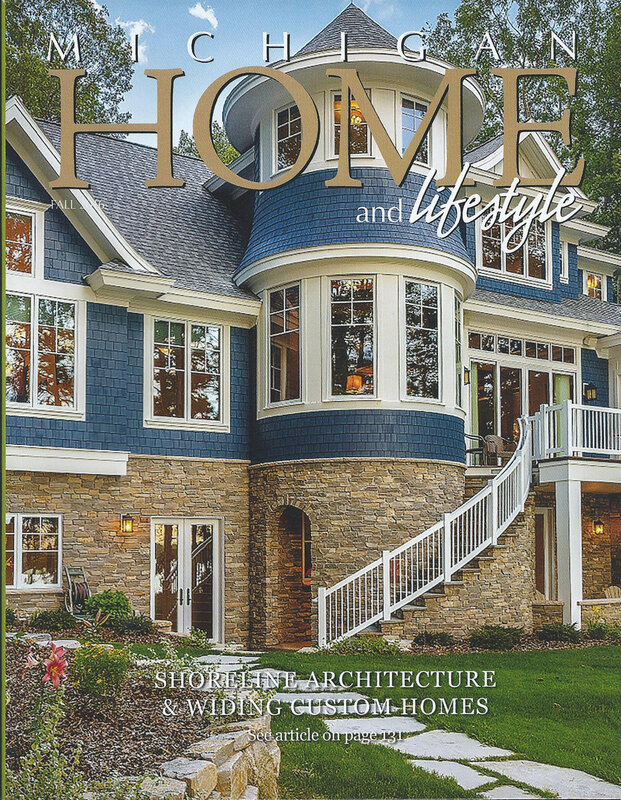 “…A home well-designed for it’s bayside location with multiple peaks, porches, walkways and overlooks all highlighting the view across famously gorgeous East Grand Traverse Bay” (p. 124). Issue Credit: Stadel Media, Inc.
Conat, C. (2016, Fall). A Modern Victorian with a View. Michigan Home and Lifestyle, 131-139. “Sitting on a bluff overlooking quiet Green Lake is an amazing, one-of-a-kind home” (Conat, 2016, p. 133). “The rich tone of Kensington Blue shingle siding against the Olympus White trim and windows, complemented with Black River Northern Ledge Stone is truly breathtaking and blends beautifully on this lake lot” (p. 133). Sprawling Retreat. (2012 Autumn). Michigan Home and Lifestyle, 101(10). 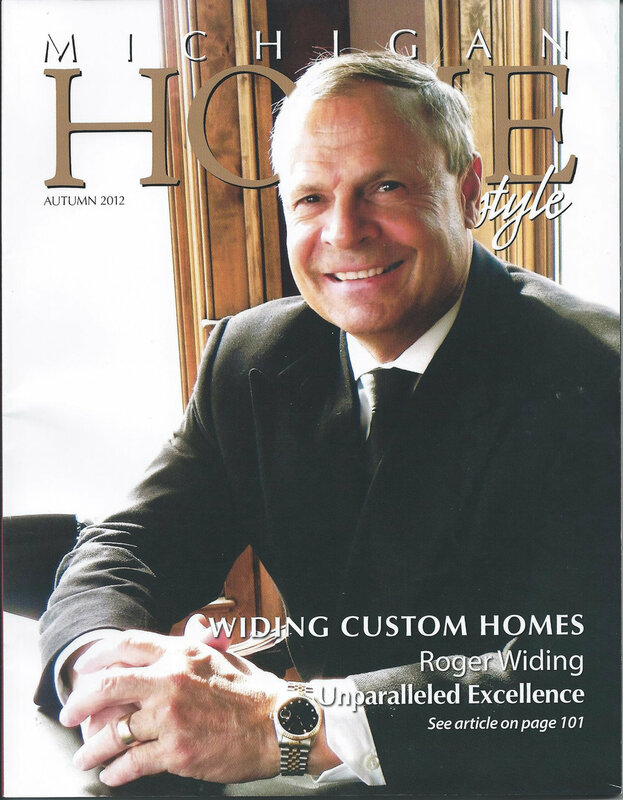 Retrieved from Stadel Media, Inc.
“Whether poolside or lakeside, homes crafted by Widing Custom Homes are built with exceptional quality and design so that you can relax and enjoy your home oasis” (Stadel Media, Inc., 2012, p. 101). “Creative allure, spectacular interiors, gorgeous millwork, stellar views, luxurious ingenuity” (Werp, K. V., 2012, p. 110). Check out Widing Custom Homes in the Winter 2018 issue of the BayLIFE North Magazine! It explores the home WCH finished on Glen Lake and gives further insight to the home owners’ vision and views of their new "Lake Legacy". If you are interested in learning more about Widing Custom Homes’ commitment to building clients’ dream homes and how this breathtaking waterfront home came into fruition, click the button below to read WCH’s article in the 2017 July/August issue of BayLIFE North, the digital version. NO COPYRIGHT INFRINGEMENT INTENDED - ALL COPYRIGHTS BELONG TO THEIR RESPECTFUL AND RIGHTFUL OWNERS.